Booths are 10 x 10 (all indoors) and cost $60 for booth only and an additional $10 for electric (available on a first come first served basis). Mark your application 'DFW Craft Shows' and you can take $10 off your $60 booth fee. Vendors are responsible for tables, extension cords (minimum 50") and all booth setup. 2 chairs will be provided per booth. 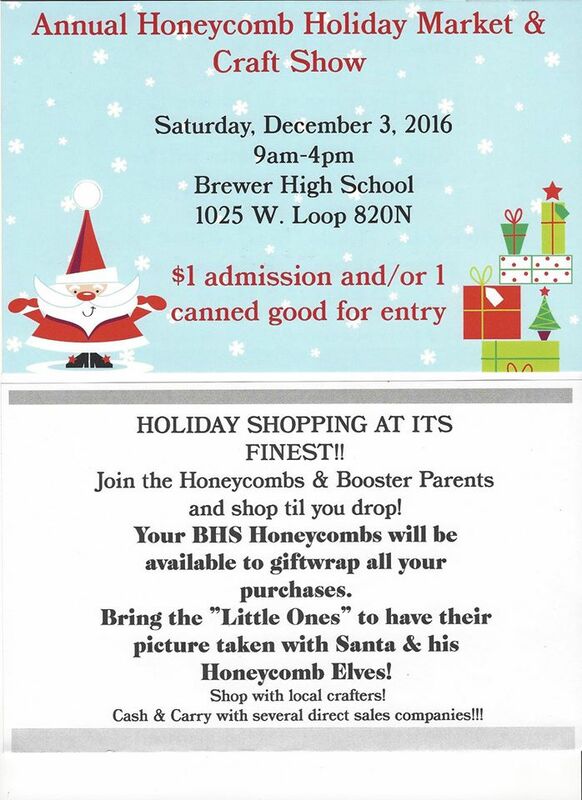 Honeycomb team members and booster club will be available to help with unloading/loading. Applications are available here and here and are due by November 26, 2016. For more information, contact their event coordinator at bhshoneycombholidaymarket2013@gmail.com / Charlene at 817-862-8985.